LeftCoast are working with Regenda Housing in Fleetwood and Blackpool Coastal Housing to bring Before I Die – a global community art project that invites people to reflect on their lives and share their personal aspirations in public. 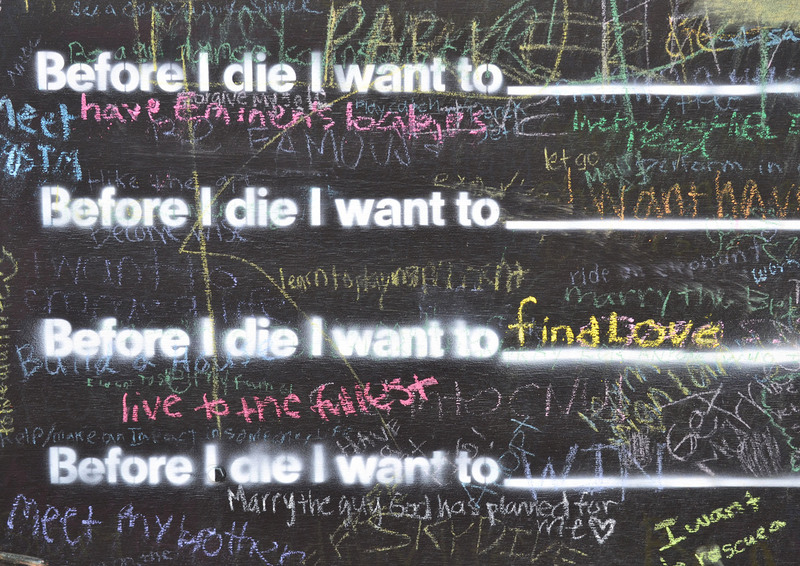 Before I Die comprises of a ‘wall’ located within the community – the original wall was created on an abandoned house in the artist Candy Chang’s neighbourhood in New Orleans after she lost someone she loved. Since then, passionate people have created walls in their own communities and there are now over 2,000 walls in over 35 languages and over 70 countries, including China, Argentina, Italy, Iraq, Finland, India, Japan, and South Africa. The wall is a positive civic engagement project to help us restore perspective, understand our neighbours in new and enlightening ways, and improve the well-being of our communities. The project has been featured on NBC, CNN, TED, and Oprah Magazine. Each Before I Die wall is created and maintained by an individual or group of people who are passionate about creating a space for their community to share more with one another, in this case LeftCoast. We are presenting the wall in two communities, Haweside and Flakefleet. We would like a photographer to document the wall in each location during its four week exhibition period. The nature of the wall is that it will change from day to day. Some days it may be full, some days someone may have wiped it clean or it might rain and wipe everything off. We require a photographer to visit each wall at different times of the day and days of the week – a minimum of four visits to each wall – to capture the different ways that it is being used. The photographs will be the only documentation that the wall was ever installed and as such are an important legacy for taking conversation forward and profiling the work in the future. For more information download the full brief – Before I Die – Photograhers brief FINAL.